The international banana industry is apparently a major step closer to salvation after scientists revealed they are closer than ever to developing fruit that is immune to TR4, a strain of the fungal disease fusarium wilt. With TR4 threatening to wipe out production of the world’s most commonly sold variety, Cavendish, new and resistant cultivars that can resist the disease have now been identified by researchers in the Netherlands, Eurofruit has learned. Under the direction of leading tropical phytopathology expert Professor Gert Kema, a team of scientists at Wageningen University & Research has assessed the potential resistance of many different types of banana from around the world, as well as genetically modified varieties and chance mutations. 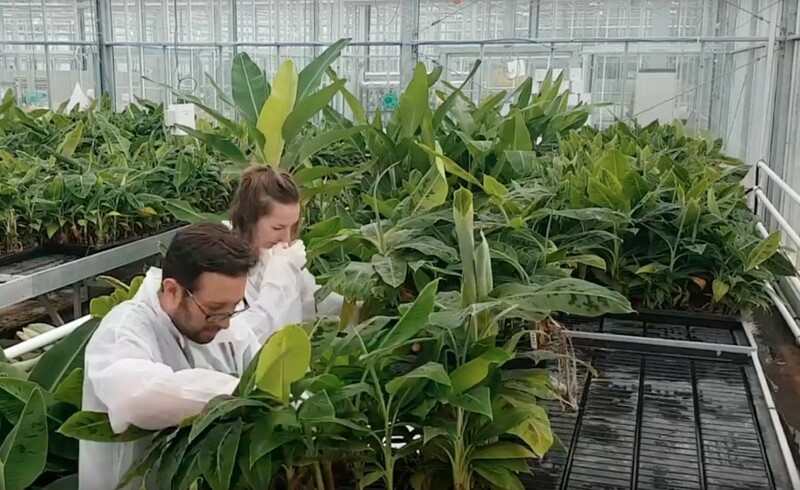 According to agronomic engineer and PhD student Fernando Alexander García-Bastidas, a key member of the project team, a number of resistant cultivars have already been found – and likewise sources of resistance to the disease – all of which can be used in subsequent breeding programmes. The group’s ultimate goal, he explains, is to develop a commercially viable replacement for Cavendish, a variety that not only can fight off TR4 but also at least match today’s market leader in terms of commercial appeal, marketability and robustness in the supply chain. Over the past six years, García-Bastidas has played a central role in screening more than 250 different banana types, coming up with a series of assessment protocols and testing 20,000 individual plants. “If one of those is resistant and meets the market expectations, we have a replacement for Cavendish,” he tells Eurofruit. Replacement is, of course, not a new phenomenon for the international banana trade, which saw Cavendish itself take over from the prevalent Gros Michel in the previous century after the latter was floored by TR4’s own predecessor TR1. Last November, researchers at the Queensland University of Technology in Australia – who have partnered with Kema’s team – published the results of a trial in which one genetically modified Cavendish plant carrying a replacement gene from a wild banana variety showed full resistance to TR4. García-Bastidas and Professor Kema were both speaking at last weekend’s first-ever International Congress of Plant Pathology in Boston.